NAVAL AIR STATION PATUXENT RIVER, Md. â July 10, 2013 â Northrop Grumman Corporation (NYSE:NOC) and the U.S. Navy have completed the first arrested landing of the X-47B Unmanned Combat Air System (UCAS) carrier demonstration aircraft on the deck of the USS George H.W. Bush (CVN 77). The Northrop Grumman-built aircraft landed at 12:23 p.m. Eastern time while the aircraft carrier was under way off the coast of Virginia, and marks the latest and most significant achievement for the program during carrier sea trials, which began in May. "Today's historic carrier landing and our operations aboard USS George H.W. 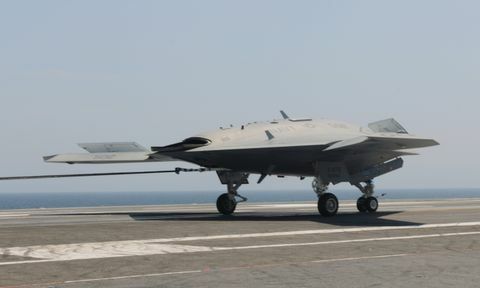 Bush show, beyond a shadow of a doubt, that tailless unmanned aircraft can integrate seamlessly and operate safely from an aircraft carrier at sea," said Capt. Jaime Engdahl, Navy UCAS program manager. "Beyond X-47B, this moment in history was made possible by an extremely disciplined and dedicated government-industry team that took a brand new unmanned combat air system from initial concept to highly successful demonstration in one of the most demanding operating environments in the world." The X-47B aircraft took off from Naval Air Station (NAS) Patuxent River, Md., July 10. A mission operator aboard the carrier took control of the aircraft and monitored the flight operations, which included several planned precision approaches in preparation for the first arrested landing. During today's testing, the X-47B completed the 35 minute journey from Pax River to the carrier and caught the three-wire with the aircraft's tailhook. The arrested landing effectively brought the aircraft from approximately 145 knots to stop in less than 350 feet. "Although it looks like it could be an easy maneuver, today's successful arrested landings points back to a rigorous test plan focused on software development and system maturity to prove today that an autonomous unmanned system such as the X-47B can safely, seamlessly and predictably integrate into Navy carrier operations," said Carl Johnson, vice president and Navy UCAS program manager for Northrop Grumman Aerospace Systems. The arrested landings aboard the Bush mark the third major aviation achievement by the UCAS-D program since May. On May 14, the X-47B became the first unmanned aircraft to be catapult launched from a Nimitz class aircraft carrier. On May 17, the aircraft performed the first in a series of precision approaches and touch-and-go landings on a carrier by an unmanned system. Northrop Grumman is the Navy's UCAS-D prime contractor. The company designed and produced the program's two X-47B air vehicles. An integrated test team of Northrop Grumman and Navy personnel executed the rigorous flight test and carrier suitability test sequence that culminated in today's first arrested landing of an autonomous unmanned aircraft. Northrop Grumman's UCAS-D industry team includes Pratt & Whitney, GKN Aerospace, Eaton, General Electric, UTC Aerospace Systems, Dell, Honeywell, Moog, Wind River, Parker Aerospace, Rockwell Collins and Lockheed Martin.